Are you a member of the general public who is interested in learning more about astronomy (and/or about the research and education activities of astronomers at Rutgers specifically)? We've set up a web page just for you here. Thinking of applying to grad school? Check out the possibilities for astronomy at Rutgers here. Several professors are seeking undergraduates to help with their research. Go to this website for a list of currently available projects and instructions on how to apply. In light of recent reports within the larger academic community, the Astrophysics Group has issued a statement opposing discrimination and harassment and offering our support to anyone in speaking out about unprofessional behavior, discrimination, or harassment that they have experienced or witnessed here at Rutgers or elsewhere. Incoming Assistant Professor Blakesley Burkhart has received the 2019 Annie Jump Cannon Award in Astronomy from the American Astronomical Society. Assistant Professor Alyson Brooks is the 2019 recipient of the Maria Goeppert Mayer Award of the American Physical Society. Professor Eric Gawiser has been named a 2018 Fellow of the American Physical Society for "exceptional leadership in the study of galaxy evolution and cosmology." Professor Saurabh Jha has received the 2018 School of Arts and Sciences Award for Distinguished Contributions to Undergraduate Education at the Full Professor rank. Elaad Applebaum, working with Assistant Professor Alyson Brooks, has been awarded a Blue Waters Fellowship from the National Center for Supercomputing Applications to be held during the 2018-19 academic year. Professor Eric Gawiser was named Deputy Spokesperson of the LSST Dark Energy Science Collaboration for a two-year term beginning July 1, 2017. Humna Awan, working with Professor Eric Gawiser, has won an inaugural Fellowship of Excellence In Computational and Data Science to be held during the 2017-18 academic year. Graduate student Jesse Rivera participated in the 2017 Congressional Visit Day. His account of the day was posted by the American Astronomical Society. Assistant Professor Alyson Brooks has received the 2017 School of Arts and Sciences Award for Distinguished Contributions to Undergraduate Education at the Assistant Professor rank. Assistant Professor Alyson Brooks has been named as a 2015 Sloan Fellow with a grant to support her work on galaxy formation. Associate Professor Saurabh Jha has shared the 2015 Breaktrough Prize in Fundamental Physics, for his role in the Supernova Cosmology collaboration. Astrophysics Seminars are held at 1:30 pm on Thursdays in room 401. Department colloquia are at 10:30 AM on Wednesdays in the Physics Lecture Hall. Public open nights at the Robert A. Schommer Astronomical Observatory are held on the second, third, and fourth Thursday of every month, weather permitting. Two terms of physics and one of astronomy were required of all students through the 1800's. George William Hill (A.B. 1859, A.M. 1862, Ph.D. 1873) went on to do fundamental work in celestial mechanics. He was the most illustrious astronomy graduate of this period, becoming a member of the National Academy of Science, of the Royal Astronomical Society (Gold medal), and a Fellow of the Royal Society (Copley medal), among other honors. 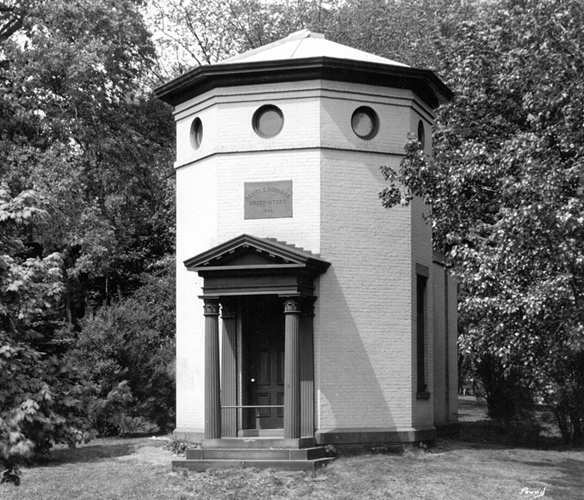 Though the university purchased a telescope as early as 1827, the first observatory on the Rutgers campus, shown to the right, dates back to 1866. The primary instruments were a 6.5-inch refracting telescope and a meridian circle with a 4-inch telescope. Robert Atkinson, on the faculty from 1929 to 1937, did early work on nuclear fusion as the source of energy in stars and on stellar nucleosynthesis. With his departure, work in astrophysics lapsed until the 1970's. More history. The number of faculty and researchers in the group doubled in the late 90's. Today, Rutgers astrophysicists use a variety of space borne observatories, including the Hubble Space Telescope (HST) and Chandra X-ray Observatory, as well as world-class ground-based facilities. Researchers and students work across the electromagnetic spectrum from radio and submillimeter, to infrared and visible, to ultraviolet and X-ray wavelengths, including playing key roles in the development of new instruments. 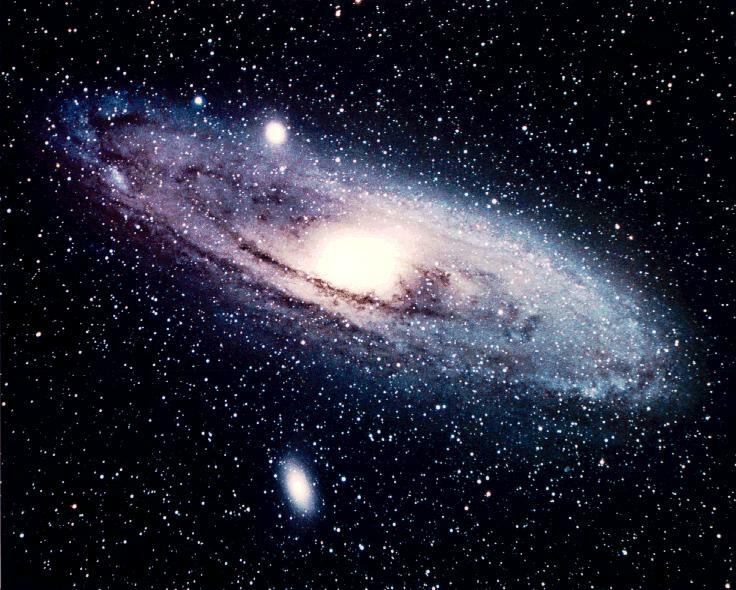 Rutgers has strong programs in theoretical astrophysics, especially in the large-scale structure of the universe and in the formation and evolution of galaxies.